This post is for Bloggers Tuesday at the Home Baker’s Guild. Intros have always been tough for me and today also I am struggling for words to get this started. Hello! I am Rajani – a blogger, baker and a home maker. Thank you for having me as a Tuesday blogger here. I am from Kerala, now settled in Chennai. I worked in the IT field for seven years before quitting to take care of my son, Shreyas. When our son turned one, we relocated to London. That year marked a lot of changes in my life. For the first time, there was an oven in the house. I was excited and soon started trying out recipes from the net. Not surprisingly, a series of flops followed. Dry cakes, soggy cakes, extremely chewy biscuits, teeth breaking breads and what not! The worst was the cake which I fondly baked, beautifully decorated and proudly presented as a birthday gift to my friend…only I didn’t know that it wasn’t cooked properly! Batter oozed out when my friend cut it – can you imagine that!? I was lucky that there was no one else there and that she was a very close friend. Soon after the cake incident, my friend (yes, we are still friends!) sent across some blog links to me. Slowly I got hooked to the blogging world. More cakes, bakes and flops followed – but I kept trying and my husband kept suffering. I started clicking pictures of whatever I cooked – more as an evidence that I am not starving my family than anything else. But slowly, a genuine interest in food photography developed. We came back to Chennai an year later and this time, we bought an OTG. It’s a long time since and my OTG has stood by me through many successes and many flops. 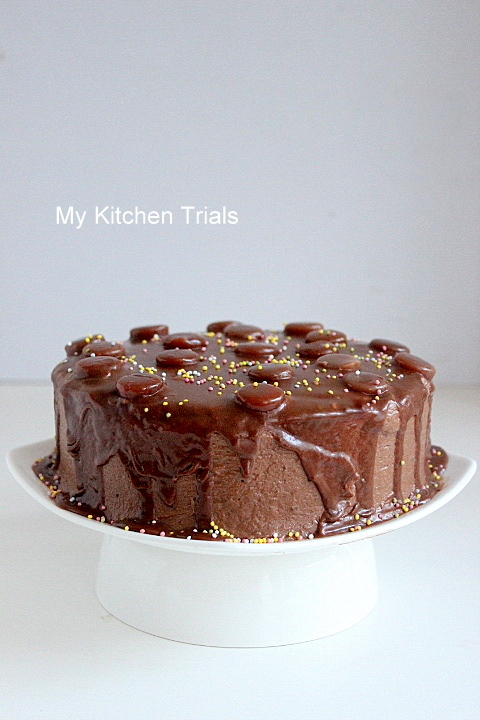 Three years before, I started scribbling my cooking and baking trials in my own space : My Kitchen Trials. Now, coming to the recipe here, I was looking for an eggless chocolate cake and a good friend suggested this recipe. This has become my ‘go-to’ chocolate cake recipe now. The icing too is wonderful and pairs well with the cake. 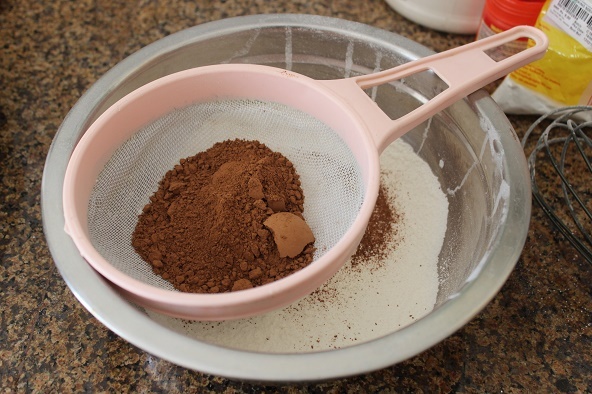 Sieve flour and the cocoa powder. This gets rid of all the lumps easily. Add sugar, baking powder and baking soda. Whisk until mixed. Make a well in the centre and add the wet ingredients one by one. Whisk until everything is incorporated and no dry lumps remain. 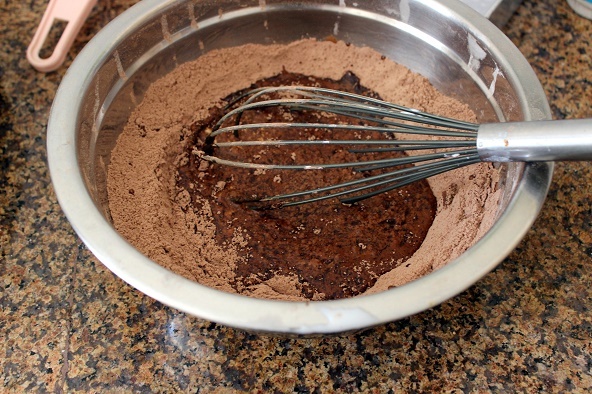 Pour the batter into a greased and lined 6″ or 7″ cake pan. Bake in a preheated oven at 180C for 30-35 minutes or until a skewer comes free of crumbs when inserted in the middle of the cake. Once the cake is baked, take off the oven and let it sit in the pan over a wire rack for 10 minutes. Flip it cover and peel off the parchment paper. 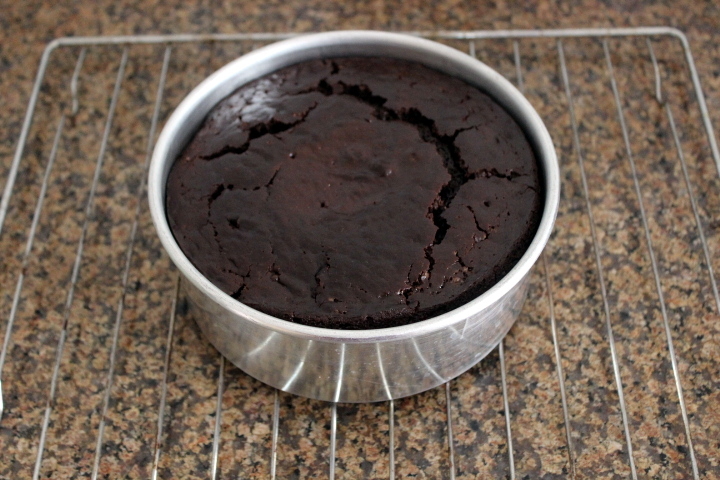 Let the cake cool completely for at least 1-2 hours before decorating it. Scroll down for the icing recipe. Chocolate icing recipe: (Source: Maria’s menu). You can check out this recipe with step by step pictures here. Mix everything well and spoon over the cake before starting to frost it. 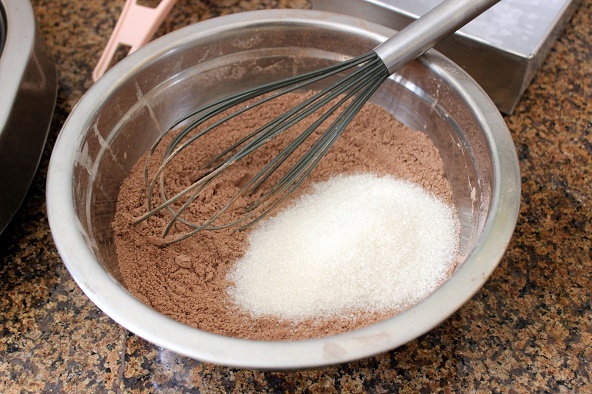 Using a spoon, mix the softened butter and cocoa powder in a bowl. Add a tablespoon of hot water to help with the mixing. Add 1 cup sieved icing sugar and incorporate it into the butter mix. Again, add one or two tbsp of hot water for mixing, if needed. Add one more cup of icing sugar (after sieving) and the vanilla extract. Mix again until you get a smooth icing. You can add hot water to get the desired consistency. You can add a bit more sugar if required, for me this was sweet enough. This amount is enough to cover and fill a 6″ cake. 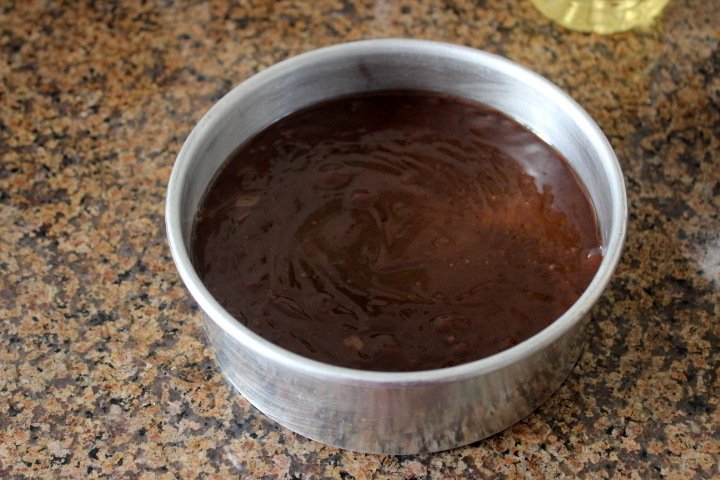 For the glaze, I took about 2 tbsp of the icing in a bowl, added 1 tbsp cocoa powder and some hot water. I went to add icing sugar to get the consistency required (which turned out to be a bit runny than I wanted :-(! ). 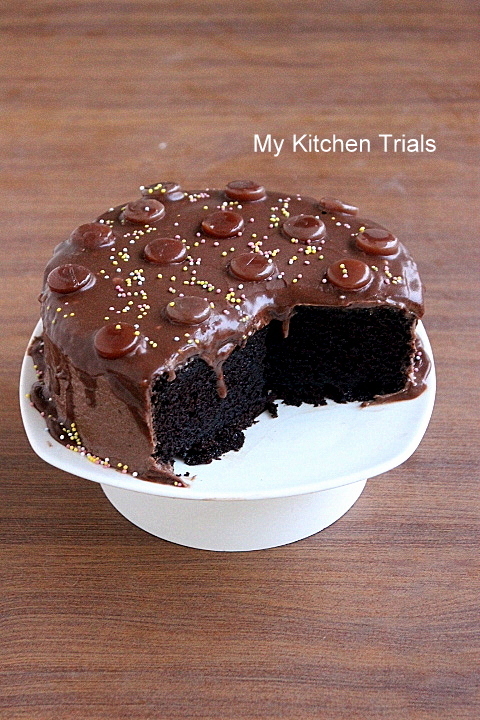 For a better glaze recipe, check out this post (Hershey’s recipe). I have used alpenliebe candies for decoration. I was not able to buy Cadbury’s shots. i cant thank you enough for this recipe..I love the dark colour of the cake..always wanted it but couldnt risk my precious dark chocolates for it ;-)…we literally could not stop eating the cake..it was very moist fluffy and everything a choco lover dreams of..but it was a little delicate.it must be because i did not halve the baking powder as i did with the other ingredients..i scooped out a little though..thanks once again.. Thanks for trying out the recipe and then letting me know the outcome :-). Glad you liked it! Hi Rajani… I was looking for an eggless chocolate cake and found this through HBG. Iam planning to bake this cake for a kids birthday and would like to know whether I can omit adding coffee powder in this recipe…or is there any other alternative.. TIA..
You can leave it out, nimmy. But its presence doesn’t add a strong coffee flavor to the cake. Yes, you can use a borosil bowl for baking. A convection oven is needed for baking. Good luck :)!